Before jet-setting to Miami, the girls and I made a Target trip to get our vacation essentials. They got toiletries in 3 oz. or less… I got the Fun Stuff Silly Snacks cookbook. Logical. (Side-note: I also got Fun Stuff Cupcakes. May have a problem here) One of the first entries in the “Reinvented Classics” chapter was Grilled Cheese Kabobs. I had always been afraid to make grilled “cheese”. What would it taste like? Fake cheese in small amounts is usually fine because I mix it with other things and it’s close enough in taste to satisfy my craving. But a whole sandwich? That’s a lot of fake cheese! Enter daiya. I had been hearing good things ever since Amy’s started using it. After some hesitation I decided to give it a go and… WOW. Just wow. Never have I tasted something that brought me back to pre-lactose-intolerant Joanna. 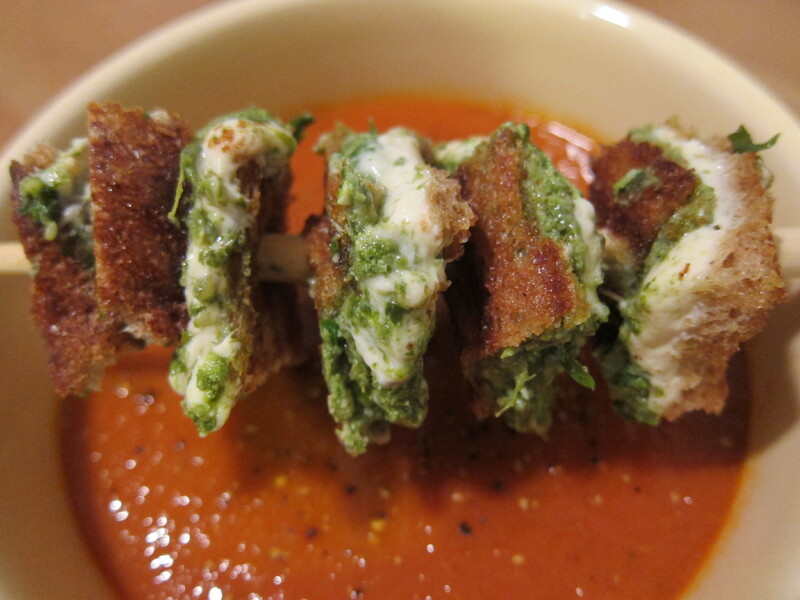 Always searching for ways to add in vegetables I modified this grilled cheese from Closet Cooking and paired it with some Double Goodness Tomato Soup. In a Dutch oven, heat the oil and butter on low heat. Stir in leeks and cook until leeks are soft but not turning brown, 3-4 min. Add in sun-dried tomatoes, oregano, and water and continue to cook for 3 minutes. Pour in the canned tomatoes, red pepper flakes, and balsamic vinegar and bring to a boil. Reduce heat to a simmer and cook for 15 min. 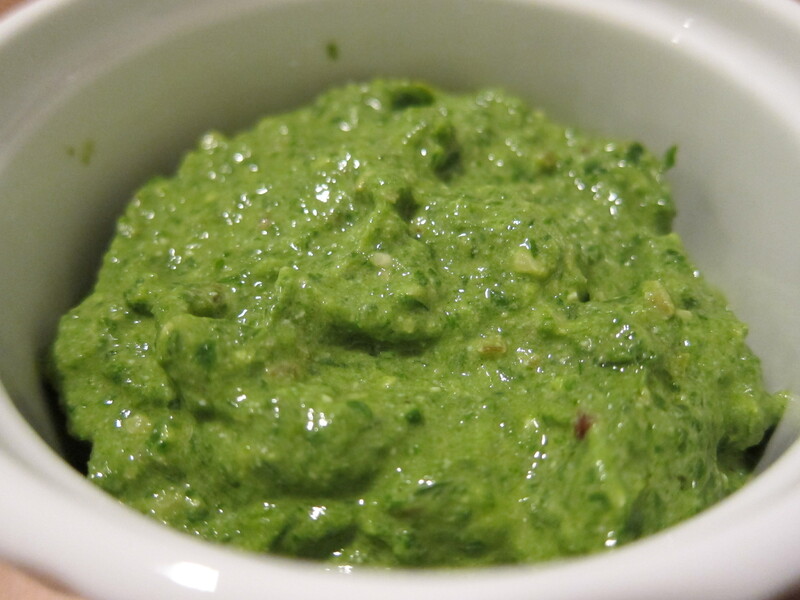 While the soup is cooking, you can make the pesto for the sandwich. It’s really easy! Add all the ingredients into a food processor and blend. Done! After the 15 minutes is up, remove the soup from heat, and puree with an immersion blender. Add salt and pepper and simmer for 5 more minutes. Now time for the sandwich! Heat a grill pan on low. 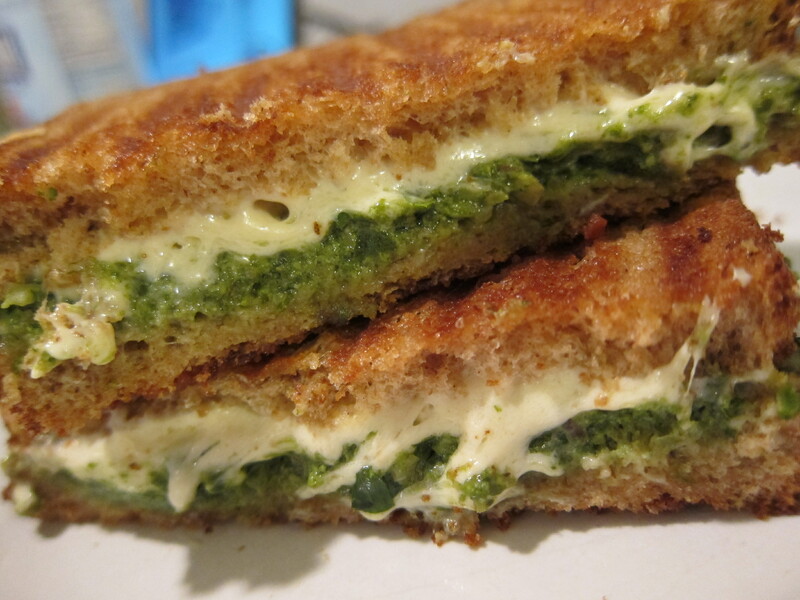 For each sandwich assemble 2 slices of bread, 1 TB butter, 3 TB pesto, and 1/4 cup mozzarella. Grill about 7 min each side or until cheese is nice and gooey. To make kabobs cut into 1-in. squares and skewer. I liked the idea of having bite-sized sandwich pieces to dip in the soup, but easily could’ve just dipped the whole thing =). Next Cupcake Fondue and Finale Party!